Uses For temporary relief of pain and itch associated with: minor skin irritations; minor cuts; minor burns; minor sunburns; rashes due to poison ivy, oak or sumac; insect bites; scrapes. 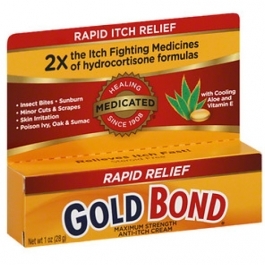 Soothing, cooling formula works to provide immediate relief of itching and pain. Plus! Steriod and hydrocortisone free. Directions Adults and children 2 years of age and older: Apply freely to affected area 3 or 4 times daily. Children under 2 years of age: Consult a doctor. Warnings For external use only. When using this product: avoid contact with eyes. Stop use and ask a doctor if: condition worsens; symptoms persist for more than 7 days or clear up and occur again within a few days. Keep out of reach of children. In case of accidental ingestion, seek professional assistance or contact a Poison Control Center immediately.